Gordon Hayward’s injury on opening day of the NBA reverberated throughout the sports world on Wednesday. Prayers and heartfelt messages of a quick recovery poured for the newly-acquired Boston Celtics forward on social media and one of those came from no less than basketball icon Kobe Bryant. The LA Lakers legend knows how it felt to suffer that horrific ankle injury because “he has been there’’ before. On Wednesday afternoon, Bryant wrote a message of encouragement to Hayward on Instagram. Bryant after also advised Hayward to “focus on the recovery process day by day by day. Bryant tore his Achilles tendon at the end of the 2013 season and was never the same player again. He retired in 2016 after a sterling 20-year career with the Lakers. Howard, who last July moved to the Celtics from the Utah Jazz for $128 million, fractured his left ankle in their season opener against Cleveland Cavaliers at the Quicken Loans Arena. Just minutes into his debut with Boston, Hayward collided with LeBron James in mid-air during the first quarter and landed awkwardly, with his left ankle turning at an angle. Both Cavs and Celtics players were visibly shocked by the injury to the 27-year-old before the Cavaliers eventually won, 102-99. Celtics head coach Brad Stevens said he hopes Hayward to recover fast. 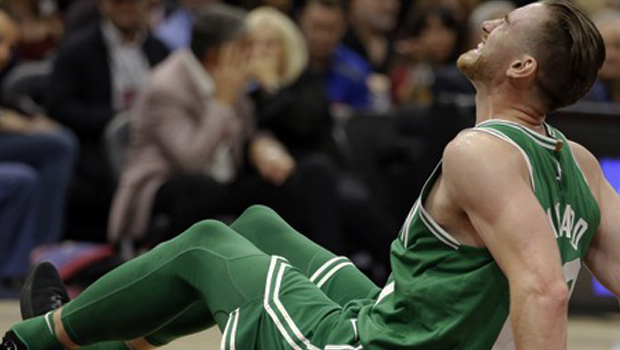 Hayward is expected to be out of action for a long time as he recovers from the injury, his absence surely a huge blow for the Celtics to overcome. Celtics’ other new signing, Kyrie Irving, was booed during the game on his return to Cleveland, after he asked to leave the Cavs last summer. In the other opening game, defending champions the Houston Rockets nipped defending champions Golden State Warriors, 122-121, at the Oracle Arena.